My daughter loves giraffes. I saw this pinned on Pinterest and thought of Sophie right away. She’s been asking me for weeks to do this project and I finally caved in. It was a simple and fun project. I highly recommend it for all you giraffe lovers out there! 1.) Collect all the supplies. 2.) 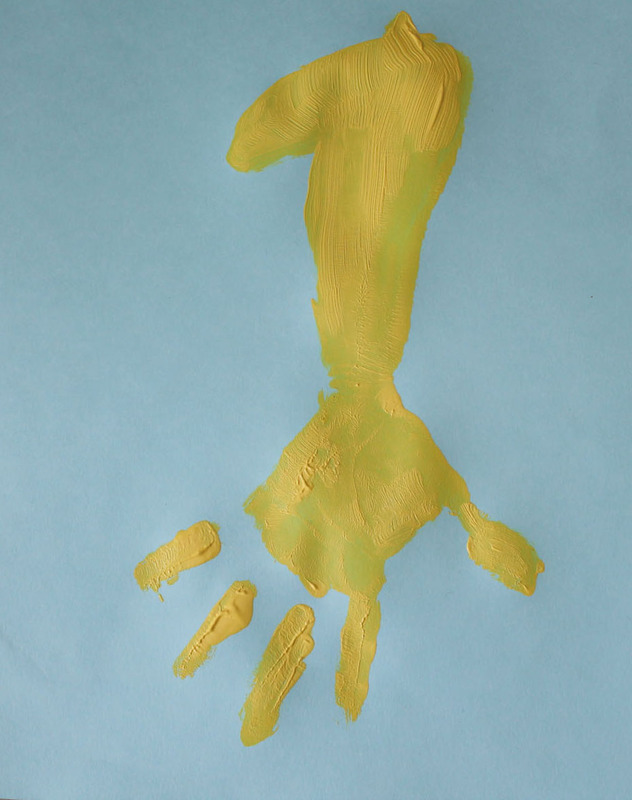 Paint your child’s hand and forearm yellow. 3.) Stamp the hand and forearm onto your paper. You will need to paint on the head of the giraffe after you stamp. 4.) Let the paint dry completely. 5.) Draw in the giraffe spots, tail, horns, mane, notes, mouth and hooves with brown marker. 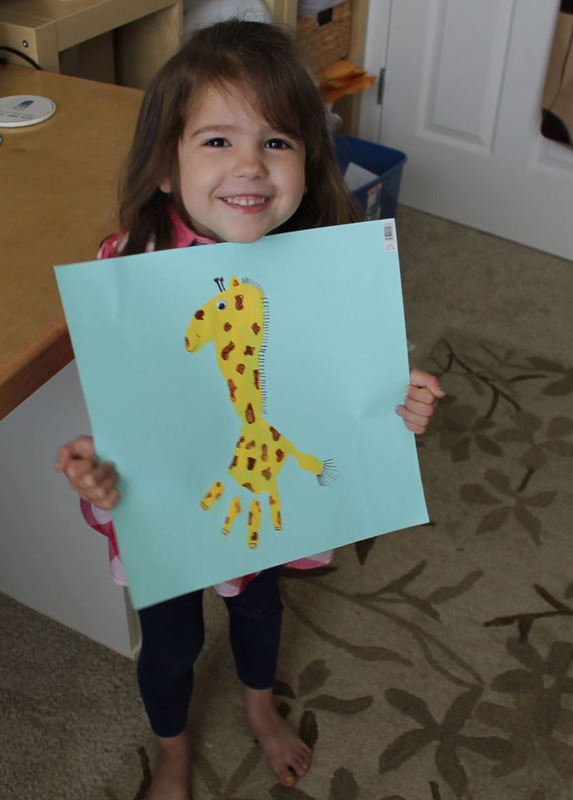 And here’s my giraffe lover with her latest piece of artwork! Product Link: http://www.handprintcreations.com/handprint_and_footprint_examples.html This is actually a link to a product. 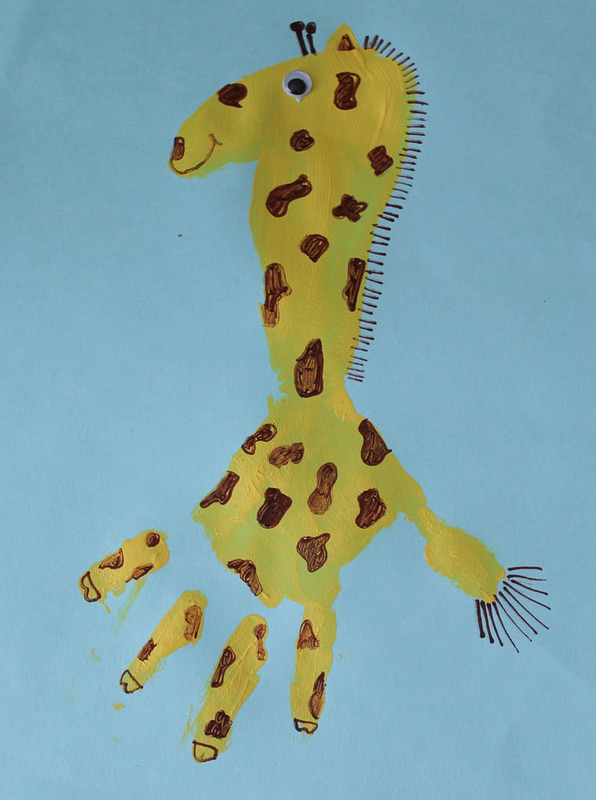 This website sells the kits to make different handprint animals. I had all the supplies I needed at home, so I did mine for free! I think we’ll do the moose one next! Time: 30 minutes including drying time! Linked up at Skip to My Lou Made by you Monday (#410). My daughter loves to do projects. Every day she asks me “what project can we do?” I remembered a cute footprint project I’d seen on Pinterest. As I usually do when she asks “what project can we do?” I placed her on my lap and we looked at my “Kid Stuff” board on Pinterest. 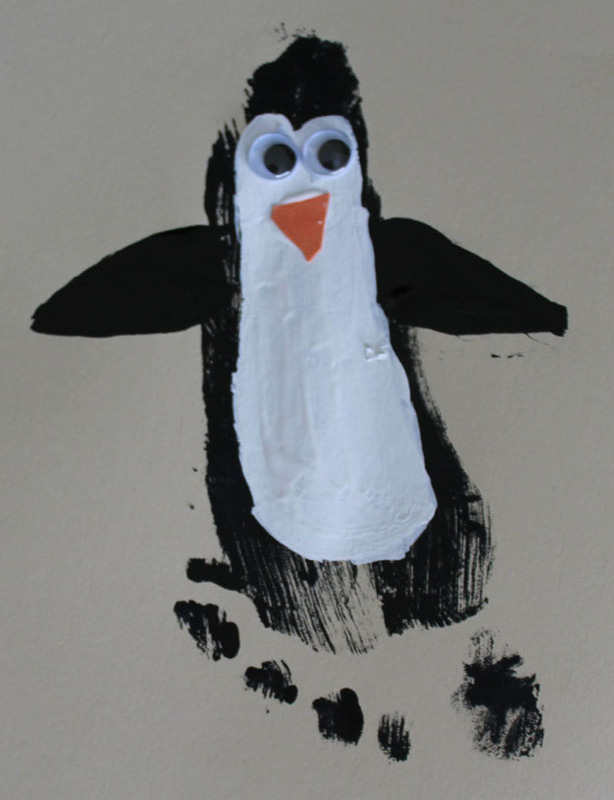 I quickly found the penguin footprint project and she was instantly in love! She is really into a Disney show called Octonauts and her favorite character is Peso (a penguin), so she was super excited. This project was very easy and fairly quick. 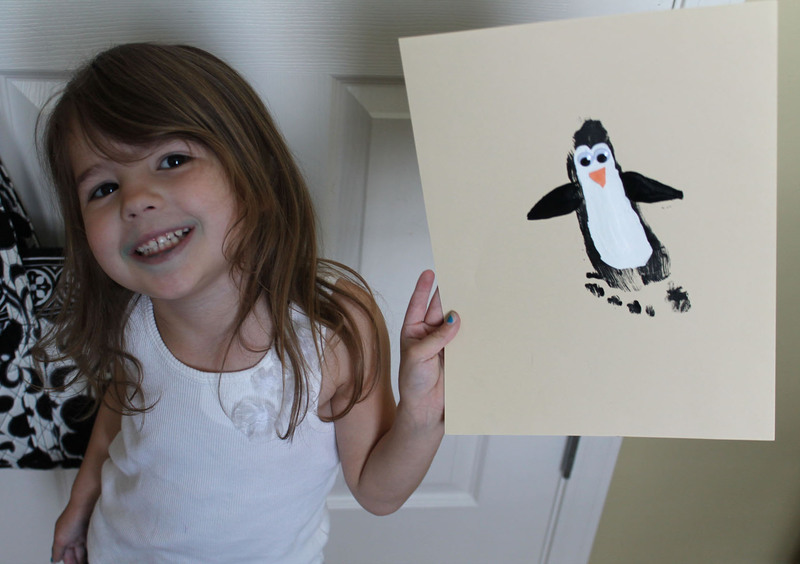 It satisfied my daughter’s itch for a project, and it was fun for me, too! 3.) Black paint (I used acrylic). 5.) Orange paint or orange construction paper. 2.) Paint the bottom of your child’s foot black. Put it on pretty thick and paint fast so it doesn’t dry. 3.) Stamp your child’s foot on the paper. 4.) Paint on some wings. 5.) Set aside the paper and wash up! 6.) Let the black ink dry. 7.) 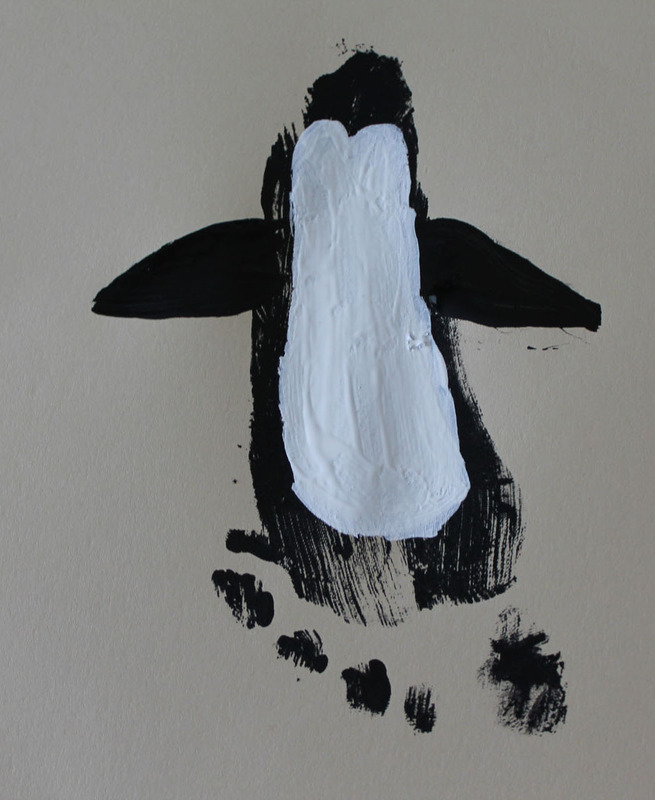 Paint a white belly on the footprint. 8.) Let the white paint dry. 9.) Press on the googly eyes. 10.) Paint on the orange beak or cut a triangle piece of construction paper and glue. 11.) Admire your finished project! Ours is on our refrigerator. Substitutions: I used construction paper for the beak instead of paint. This is one of the very first holiday themed projects I ever pinned. This project was cute, simple, and fun for the kids. My 1 year old kept saying “more”. She wanted me to paint her hand over and over again! 7.) Ribbon – I used another pin to make my own small sized ribbons. 1.) Pull out all the supplies. 2.) 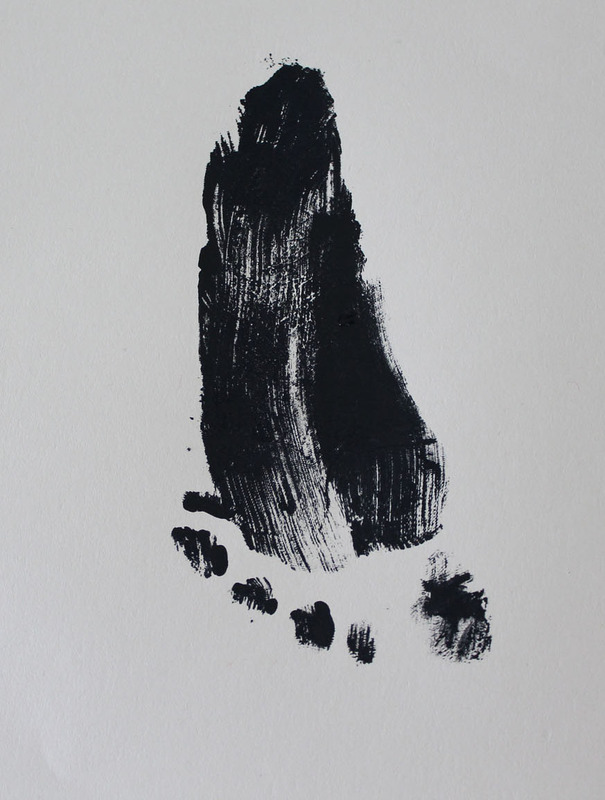 Paint your child’s hand with the black paint. 3.) Press hand down on paper. 4.) Wait for paint to dry. 5.) Glue cotton balls to form a sheep. 6.) Add googly eye to thumb. 7.) Glue bow ribbon to cotton ball. We made one for me and another for Grandma and Papa!